Pied a Terre – my first snails! The economic crisis that hit in 2008/2009 was the worst many of us have seen in our lifetime. Banks folded, bankers were on the streets, and restaurants remained empty as client entertainment became as rare as a bonus. For fear of sounding like a bad economic article, this leads me to the benefit of the GFC. Credit crunch lunches! On my recent trip to London, I was absolutely delighted that you could have Michelin rated restaurant meals for 30 pounds! Not for one course, but for THREE!! The current time is no better time for those of us who can’t normally afford to sample the best of the culinary world to see what we have been missing out on! 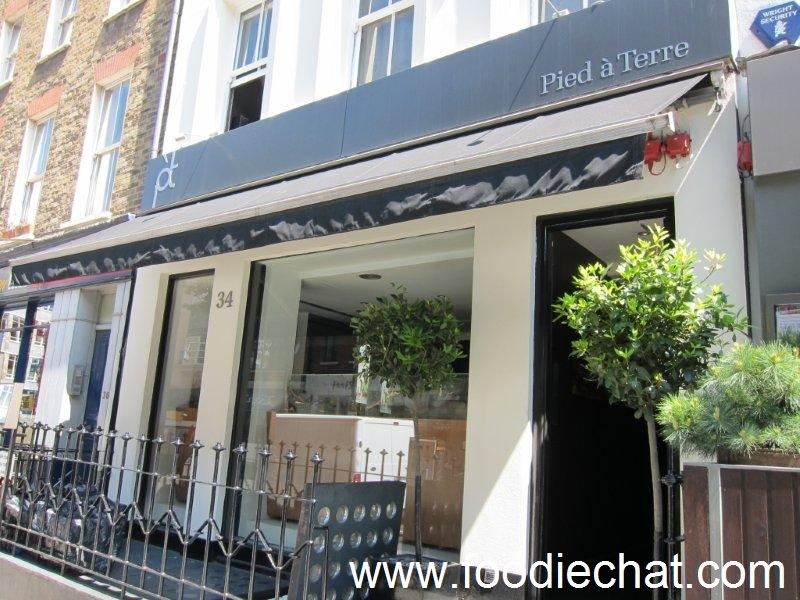 First stop, Pied a Terre. It has held two Michelin stars for some years now. 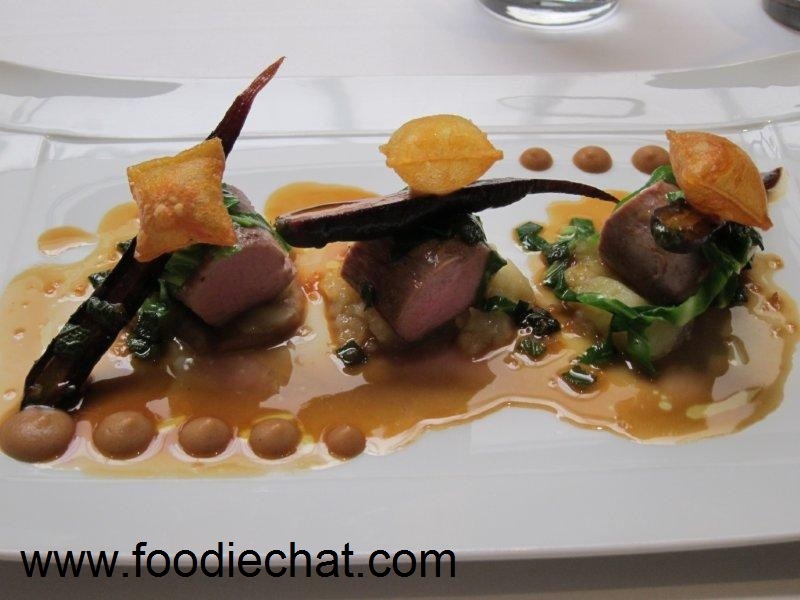 It says on its website that it offers the best value Michelin meal, with three courses plus canapes for GBP30.50. (excluding 12.5% service charge). It is located not that far from Oxford Street, near Regent Street. The dining room is very intimate, no more than 4 tables in the front half and approximately 10 tables in the main dining area. Three of these were set out for solo diners like me that day. 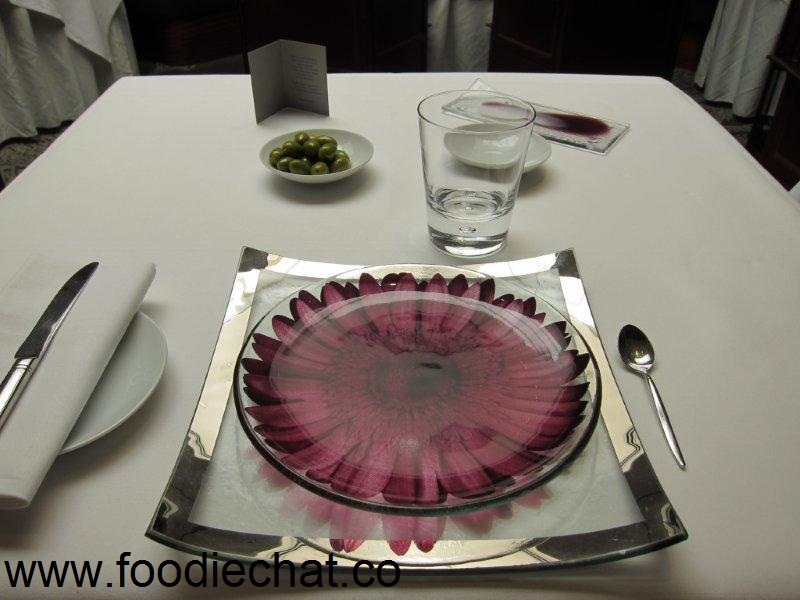 A gorgeous gerbera plate set your place, a dish of salted green olives for nibbling as you select your meal. It’s settled, the lunch set menu for me! 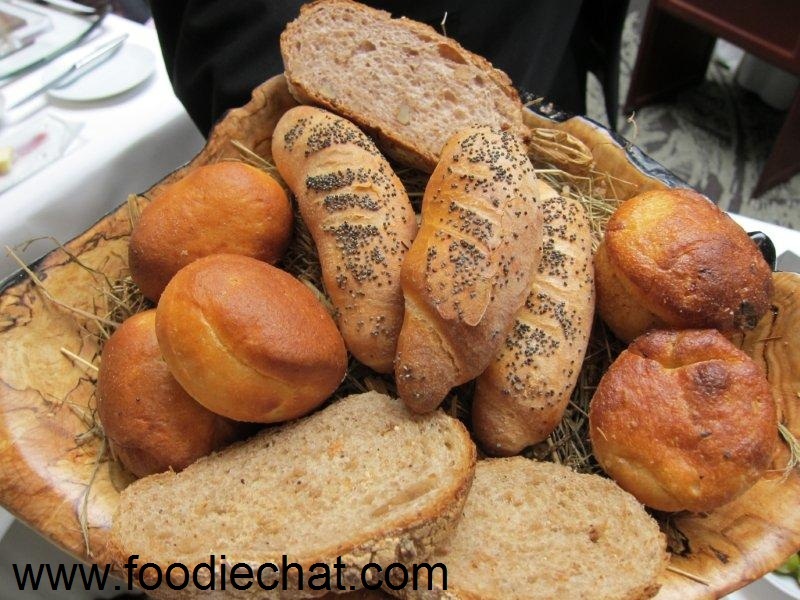 And out comes the bread basket, which is offered to you throughout your savoury courses without having to be asked, as it should be with Michelin ranked restaurants. That day, cheese and bacon savoury scone was offered, as was wholemeal slice, french style, poppyseed and star anise flavoured. The savoury scone was fluffy like a muffin, slightly oily to the touch but delicious and warm. I have to admit though the star anise flavour was slightly overpowering for me. The canapes of the day were a gnocchi, still warm and pan fried, a pumpkin mousse that was cold and served with crumbled blue cheese on top, and a poppyseed wafer filled with foie grois mousse. The gnocchi was delightful. Topped with a shaving of parmesan, it had a good al dente texture, not too soft as it was a finger food – more like a savoury potato croquette, but softer. The mousse was sweet but I would have preferred it slightly warmed, and surprisingly the cheese wasn’t overpowering at all! The wafer was thin as paper, and crisp, and delicately balanced on a two pronged fork like instrument. 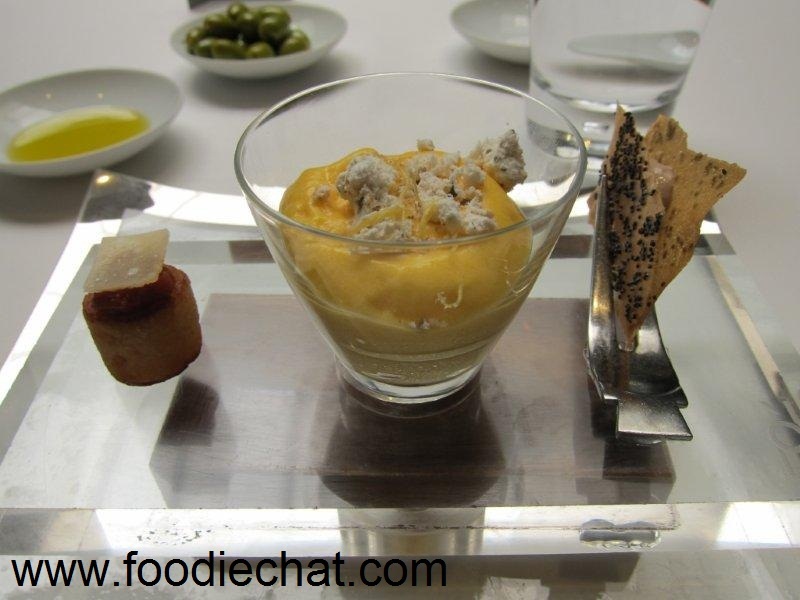 These three canapes were certainly a treat, and rivalled some other Michelin restaurants (to follow in Foodiechat!) in terms of value, as the serving size was more akin to an entree! So the choices for the entree were snails or cured kingfish. Hmm… I must admit, although this blog is called “FoodieChat” and I do adore food, I by no means claim to have a sophisticated palate! I, like most people, had reservations about trying snails. But where better to try them than at a Michelin restaurant? Here goes! The plate came, looking like a work of art. Six snails were served with mushroom beignets (like mushroom tofu puffs! 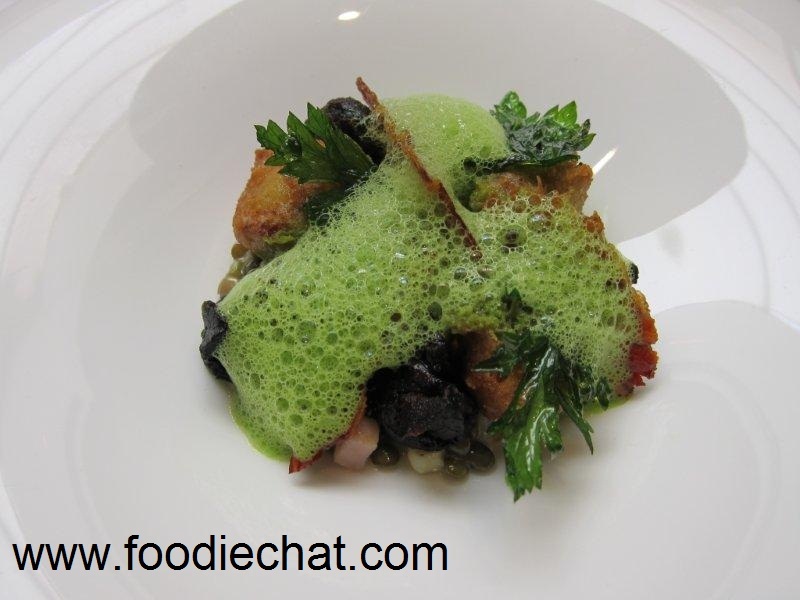 ), lentils, smoked bacon and parsley veloute. The squeamish thoughts in me thought the foam reminded me of snails frothing when as a child I used to salt them!. Surprisingly, the snails were very tasty! Unfortunately, I could not help but recognise the slug like bit. I struggled to look at it, instead concentrating on the creaminess of the mushroom beignets, the delicious bacon dice and the lentils contrasting with the crispy parsley and the garlicky snails. Well, just re-lived that memory. Next came the pork fillet, served on sweet apple puree with roasted baby carrots, pomme souffle (Those crispy pillows on top! ), spring greens and sage jus. Look how gorgeous the plate looked. It was an absolute work of art. Print this on a canvas and stick it on your wall, it would not look out of place. The pork was melt in your mouth tender, pink but not not bloody, lean but not tough. And those pommes souffles – the best chips ever. The carrots were deeply caramelised and so sweet, the bed of apple puree sweet but just the right amount of tartness as well. As you can see, the servings were very generous at Pied A Terre. And they also were generous enough to give a pre-dessert. 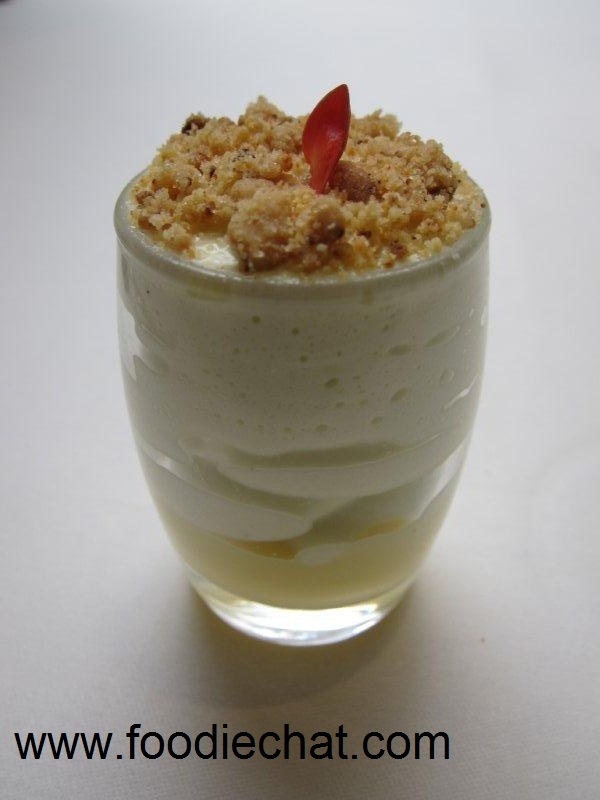 It was a jasmine tea mousse on top of a custard topped with crumble and a delicate placed mini red petal. The mousse was so refreshing and cooling and I wanted to dive right in and have it in one spoon. But Michelin starred food is to be savoured slowly and enjoyed, unravelling the flavours in each lick. And finally, the dessert of the day. The service was friendly, unobtrusive. but my one complaint is that the dessert was served whilst I was at the bathroom Resulting in some ice cream melting. 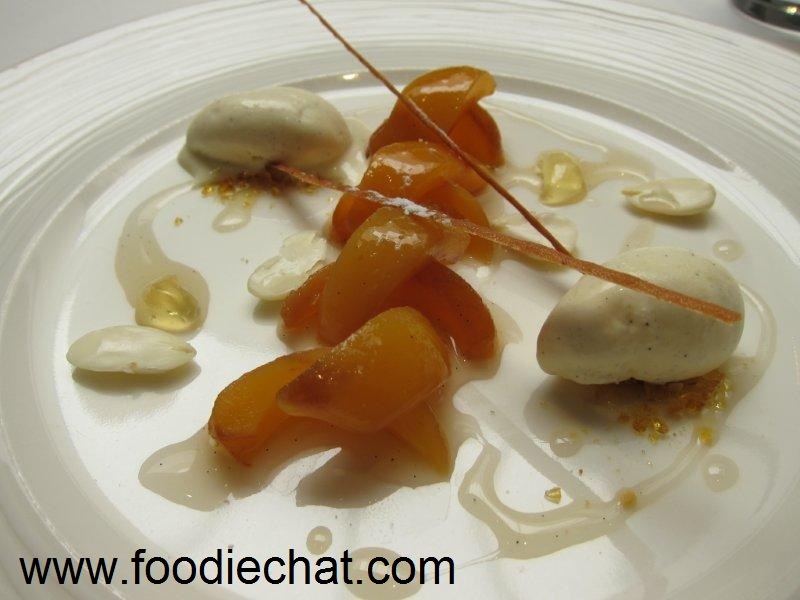 It was a poached loquat with honey jelly, vanilla bean ice cream and almond tuilte. It was very refreshing as it wasn’t overly sweet. And again, very beautiful to look at. All in all, I loved this meal. The price they charge you is a steal – I have no idea how they can make money on this. Thirty quid for three Michelin starred courses. I wished I lived in London and could enjoy this calibre of food, the price being the icing on the cake. 34 Charlotte St, London W1T 2NH. 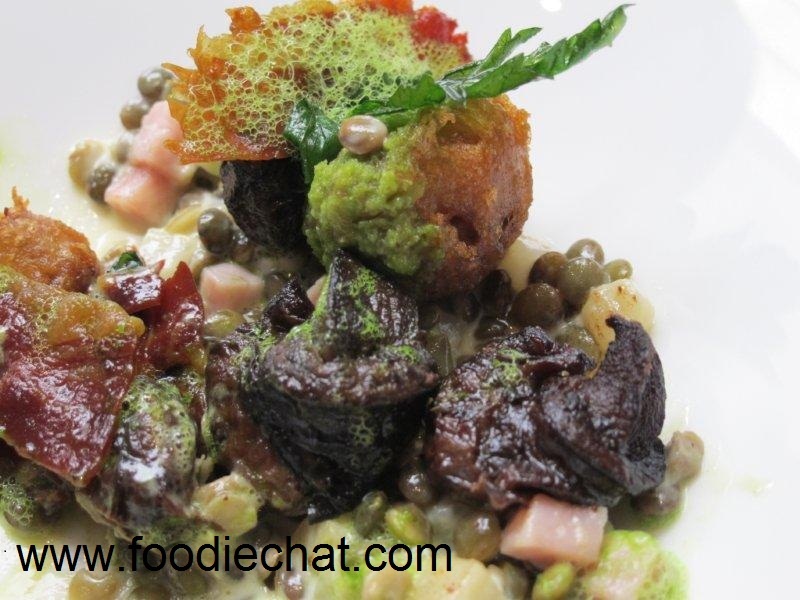 You are currently browsing the FoodieChat weblog archives for June, 2010.